Easy to read indicators featuring the latest digital technology. 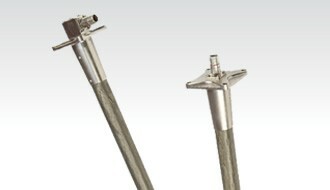 LMS engineers and manufactures, to exact specifications, commercial and military grade Digital Fuel Quantity Indicators. We integrate the latest technologies in delivering digital devices that our customers know they can trust. The LMS Digital Indicator is available in a compact 2” square or round package and can be modified to suit any application. 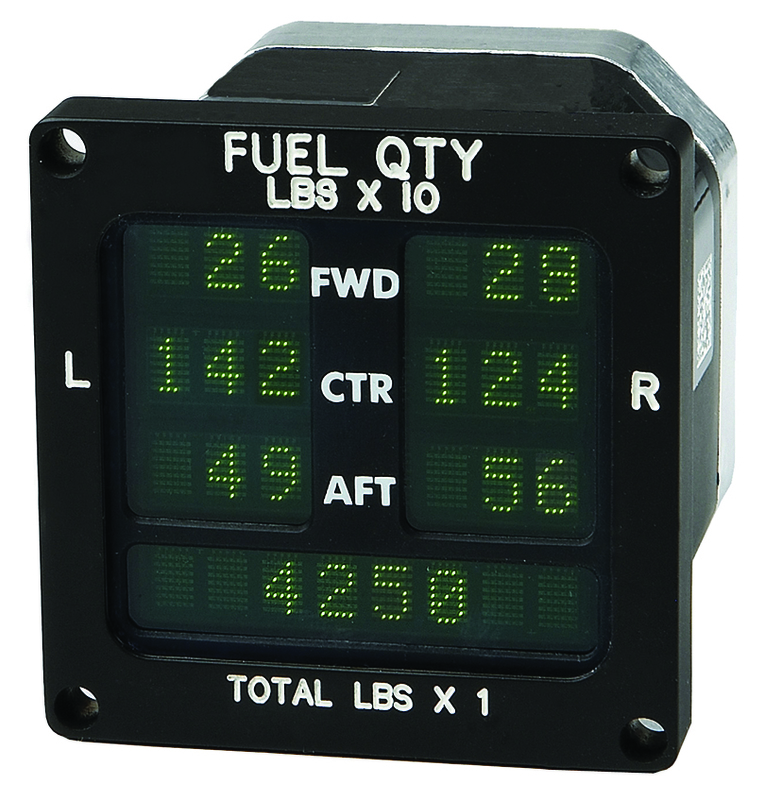 The indicator shown below is a single EMI protected Multi-Tank Display (MTD). This indicator is night vision (NVG) compatible and sunlight readable. The MTD features a continuous display of up to 6 tanks plus total fuel. Other configurations are available. The LED display of the square indicator utilizes four, 8 alphanumeric character, high-intensity LED displays. The mechanical enclosure divides the display into seven fields; six 3-digit fields for each of the individual fuel tanks, and an 8 character field for display of total fuel. 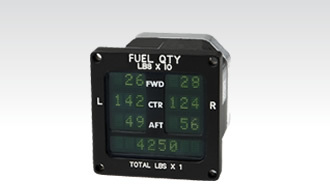 The total fuel field is also used to post error conditions detected by or communicated to the MTD. The display is designed to allow fuel weights of multiple tanks and total fuel weight on the aircraft to be displayed simultaneously. The display uses a standard display controller. Firmware communicates with the controller to show text on the display. 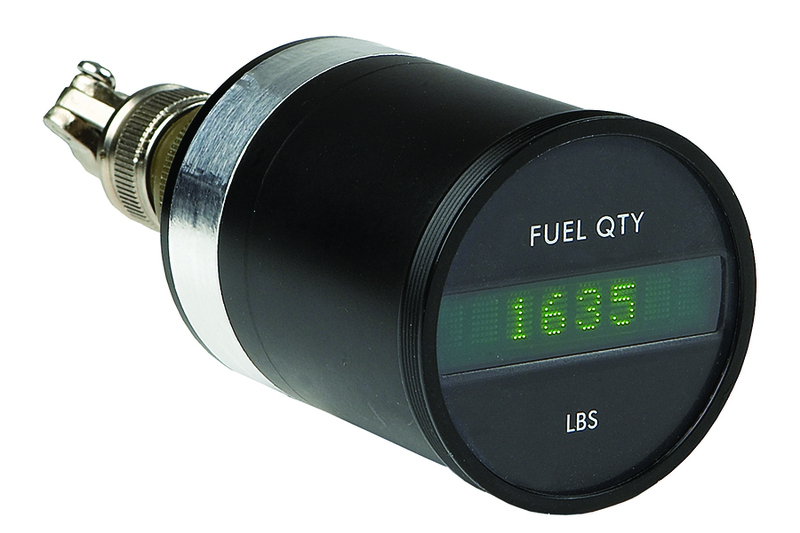 The 2” round digital indicator provides 8 alphanumeric characters that can be configured to display fuel quantities. Total fuel and additional tank quantities can be displayed by means of an external selector switch. 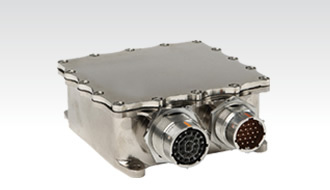 All BIT function is implemented in firmware, but requires supporting hardware for many of the tests it performs. Firmware is responsible for executing BIT and reporting errors appropriately. Continuous BIT (CBIT) tests are performed while the unit is running. Initiated BIT (IBIT) are executed in response to receiving an IBIT started message. For product inquiries or questions, please email: marketing@liquidmeasurement.com, or submit the contact form below.